Joe Shuster, co-creator of Superman, once said there was a “little bit of Harold Lloyd” in his character’s alter-ego, Clark Kent. I can see it. Like Kent, Lloyd’s characters tend to be earnest go-getters; inept at first-glance, but underestimated. They’re unfailingly good men, and though they make bad decisions, it’s usually for the right reasons. The Boy in Safety Last! is a typical Lloyd character, and as it happens, he also follows a trajectory not so different from Superman’s. Country-raised, he longs to marry the Girl, and so he seeks his fortune in the big city. Like the red-and-blue hero—and unlike many country types of the silent era—the Boy remains uncorrupted. In fact, he lives city life as cheaply as possible, even going without food so as to afford presents for his Girl, which he mails to her along with letters extolling his success. The Boy would be a perfect Man, if the letters were accurate. Instead, he describes his dream job—president of a department store—as though he already had it. The Boy is actually a retail clerk in the store. But we know he’s only lying to his Girl because he fears losing her, and as long as things aren’t rushed, he’ll do fine. Unless the Girl (Mildred Davis) pays him a surprise visit. People remember Safety Last! 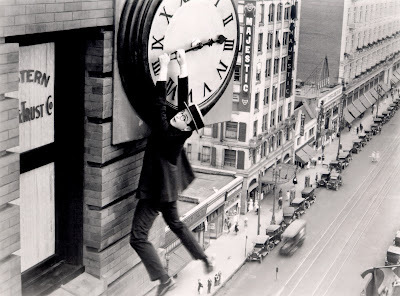 for its final 20 minutes: a thrilling sequence in which the Boy scales the exterior of the department store building. But the middle of the film, taken up with the Boy’s attempts to hoodwink his Girl into thinking he runs things, are just as well-crafted. Note, for example, Lloyd’s reaction upon seeing her show up in the store: he isn’t paralyzed with fear; he doesn’t even double-take. He’s joyful. He really loves her, and so he rushes to embrace her well before the problem dawns on him. This sort of reaction is crucial, because without it, we would want him to be found out. Instead, we laugh as he adopts a managerial attitude toward his co-workers (who, because they like him, do not blow his cover). Then we cringe, as the Girl asks to see Lloyd’s office, which actually belongs to his boss. He makes the dangerous decision to take her inside, while his boss is out for lunch. Several mishaps ensue, and the Boy (barely) maintains the ruse, thanks to his quick thinking, or to put it more honestly, his ability to suddenly, and convincingly, lie his face off. The office scene prefigures future events. The next day, Lloyd will be clinging perilously to the side of the department store building—sixteen floors up—because of another lie his character can’t afford to have revealed. Earlier in the film, we were introduced to the Boy’s Pal (Bill Strother), a pool-playing cat with a talent for wall-climbing. The pair devise a scheme, in which the department store’s boss will pay the Boy $1,000 to climb the side of the building, for publicity--unaware that the Pal will be the one doing the climbing. Boy and Pal will then split the purse. Unfortunately, the Pal has already drawn the attention of a beat cop (Noah Young), who begins chasing him just before the climb is to begin. With an enormous crowd milling around the base of the building, the Boy has no choice but to begin climbing himself. Anything for the Girl. Safety Last’s climbing scene remains Lloyd’s greatest cinematic achievement—a seamless combination of slapstick and camera tricks that have us holding our breaths with every storey. In the course of his terrified crawl up the building, the Boy faces pigeons, netting, belligerent onlookers from the windows, and even a wooden plank, slung out of one room by a pair of painters, that arches Lloyd back and away from the wall. Only by grabbing the end of the board is he saved. This is the scariest moment of the climb, but not the most famous. That honour, of course, goes to the clock sequence, in which Lloyd finds himself dangling by one end of a giant minute hand. The crowd below is concerned, and so are we. Perfect on its own, the climbing scene is also a testament to Lloyd’s mastery of character up to that point (with credit to his writing team, which included Lloyd’s friend, and future Our Gang impresario, Hal Roach). As the office-scene proved, our hero is a natural fibber with an ability to adapt quickly to circumstances. While not brave, he is single-minded, willing to suffer for a cause, and certainly devoted to his fiancé. We can believe he would make this climb, though he might not be happy to do it. Further, the climb itself scares us, because we want a good person like the Boy to prosper, and because Lloyd, unlike lesser clowns, respected physics and was unwilling to let us believe he could survive the fall. The ledges he teeters on are dangerous spaces—one wrong move could kill his Boy. In this way, the big climb is simply a variant of his boss’ office, which the Boy occupies at his peril, waiting for one of several doors to open and one of several superiors to enter, out him, and destroy his future. Both scenes make us tense on his behalf. Because I liked him so much, I let the Boy get away with being a scoundrel throughout Safety Last! But there’s another reason, too—born of a suspicion I have. I think that, given time, Lloyd will be the great man he pretends to be right now. Why not? He shows up early for work every day, doesn’t fool around and doesn’t overspend, at least on himself. He’s even nice to his co-workers. The Boy has all the makings of a good boss. All he needs is time, then his life-mixture of hard work and half-truths will pay off for him, and for the store. I guess I see the big ‘S’ beneath the Boy’s tweed suit, even if he can’t. 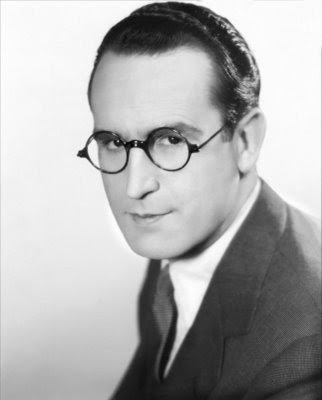 And I can appreciate how Clark Kent and Harold Lloyd resemble each other most: not in their mild-manners or the round-rimmed glasses they hide behind, but in their strong chins. Where to find Safety Last! Safety Last! is available on Volume One, Disc One, of The Harold Lloyd Comedy Collection. The disc includes several other Lloyd films: Ask Father (1919); From Hand to Mouth (1920); An Eastern Westerner (1920); and Girl Shy (1924). Unfortunately, few of Lloyd’s short films are on par with the shorts Keaton and Chaplin produced. 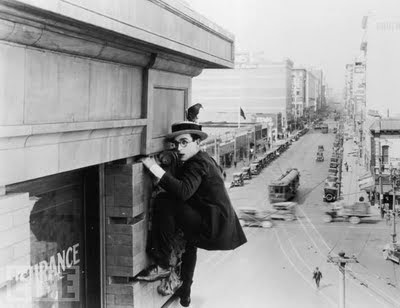 For more Harold Lloyd, see my post on his 1928 feature, Speedy. Great post! I'll definitely have to watch this one.